Faithful speech is central to the Christian life. God is not just interested in having us contemplate him or appease him. God is interested in the dynamics of life together, shaped by good communication. Just as words form our habits in relationships with other people, the words of worship can form the habits of our relationship with God and the way we live out our faith. Vertical Habits is a name given to the process of connecting words used in our relationship with people with words used to express these emotions to God. The biblical Psalms are the foundational mentor and guide in this vocabulary and grammar for worship. Wise is the congregation who studies, prays and sings the Psalms to give voice to all the emotions we express to God. 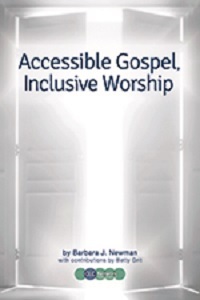 This book provides many ideas for creating an environment where you can introduce the good news of Jesus Christ to a family member or friend with an Intellectual Disability or Autism Spectrum Disorder.The book also uses Vertical Habits to give a framework for creating inclusive communities of worship where each one can use the gifts God has given to participate in a worship conversation with God. One of the ways we learn good communication habits with God is by participating in public worship. The June Grants Colloquium provided a tangible example of using the Vertical Habits to shape and form a worship service. Recipients of Worship Renewal Grants describe practical resources that helped people of all ages better understand why we do what we do in worship. The Psalms offer us language to express gratitude, lament, confession, and praise in worship. Worship Renewal Grant recipients will describe how they studied and prayed the Psalms to help children and adults understand how the psalms help shape the ways we speak to God and to one another through words, music and the arts. Churches and schools that use vertical habits say it helps their communities develop worship habits that deepen their relationship with God and affect every part of their lives. See how their experiences can help enrich worship at your church or school. Learn from two communities that used vertical habits to create safe, simple, and inclusive worship for youth and adults affected by mental illness. This article from Reformed Worship describes how focusing on Vertical Habits helps remove attention from preferences of worship style and helps link worship on Sunday with daily living the rest of the week. This article from Reformed Worship describes how connecting Vertical Habits in worship to vertical habits at home and in our everyday life brings us one step closer to making those habits our natural response. It includes practical ideas to incorporate them into family or personal devotions. On any given Sunday, you may come to church glad, mad or sad. You’re likely worshiping with people struggling to count their blessings. Meanwhile, it’s certain that somewhere in the world, God’s children are going hungry, falling ill, being persecuted, or denouncing each other from pulpits. It takes courage and faith to move from conceptual agreement that lament belongs in worship to actually groaning with fellow believers. Practical resources created by congregations and schools to help you teach the Vertical Habits in your congregation. Permission is granted to use these without any cost. We hope you will send us any resources you create for Vertical Habits. The companion website to the publication Psalms for All Seasons includes resources to connect Vertical Habits and the Psalms. New City Kids Church, a 2010 Worship Renewal Grant Recipient spent a year in the Psalms and Vertical Habits. This inspiring video was created as a response to their learning to describe the spiritual transformation of teenagers through the lens of Psalm 139. Granite Springs Church in California had a grant in 2008 to "... immerse the congregation in the Psalms through regular reading and memorization of the Psalms, a retreat, preaching, and pastoral care education that will teach people to pray all the emotions expressed in the Psalms." Learn how our Worship Renewal Grant recipients have used the Vertical Habits in their congregations and organizations. Betty Grit served as manager of the Worship Renewal Grants Program for the Calvin Institute of Christian Worship.